LTD and EMX stops less than a block from the restaurant. Owner Maurizio Paparo started Ciao Pizza Trattoria with his family in November 2007. Over the past thirty years, he has applied his background and knowledge of true Italian cuisine to create several successful businesses. In 2014 Maurizio took a partner, Chef Dave Lucht as executive chef and co-owner. Dave has been a chef in Eugene for over ten years, working with such favorites as Zenon Café, Hop Valley Brewing Co. and Excelsior Inn. 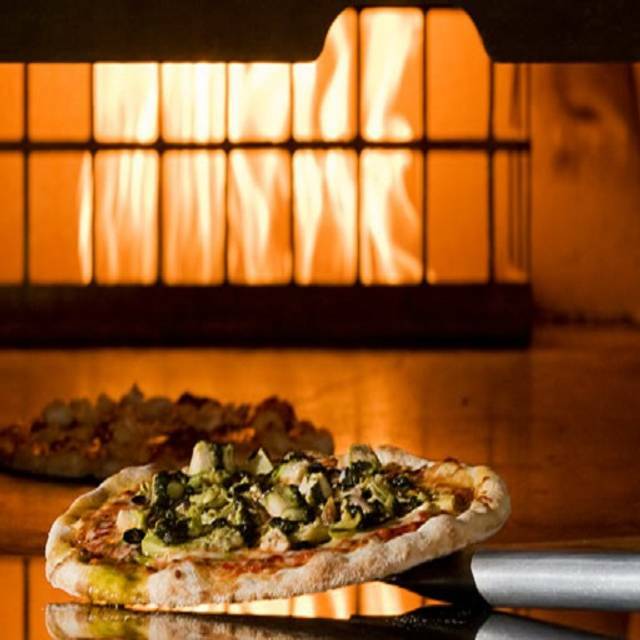 Ciao Pizza Trattoria was designed to offer the experience of an authentic Italian Trattoria. We serve made from scratch menu items, including appetizers, soups, salads, entree's and desserts. Everything is cooked in front of the customer in our exhibition style kitchen. Grab a seat at the counter and watch your food prepared! Ciao Pizza Trattoria provides a welcoming dining experience where good friendship and great food are shared. Ask your server about today's offering! The food is excellent, the staff attentive, and the atmosphere is casual enough to allow you to enjoy your meal and friends. However, I have not been able to try my favorite pizza (pepperoni) because your “Capri” pizza is so good I always order it. I will try to remedy that. Thank you. Surprisingly delicious and creative Italian food in a simple store-front location. Everything was great. Love their cioppino! It is a huge bowl of muscles, clam, shrimp and salmon. Their bread is out of this world too! My husband had a veal cutlet with polenta that was awesome! I highly recommend this restaurant! Everything was absolutely delicious! I had fettuccine Alfredo with the Parmesan chicken and loved every bite. Our server was friendly, helpful, and attentive. I’m looking forward to my next meal there. We enjoyed our meal and the service was good as well. Fresh pasta and lots of options for custom entrees. We enjoyed the cannelloni for the first time and it was excellent! Newer server named Chris and he did a good job. We hadn’t been there in a while and will definitely go back! Overall very good as usual. Great menu, great food, something for everyone. we loved and will be back! Very friendly and helpful staff, delicious pizzas for a reasonable price. We will be back. More noisy than We like, conversation was hard, had to shout to be heard. BEST Gluten Free pizza and pasta that I have ever had! Thank you for providing so many delicious choices and for being so cautious for those who have Celiac. You are a wonderful find! Can’t wait to come back and try more of your gluten free selections! My husband and I absolutely love this place! The food is outstanding. My only complaint was our last visit we were sat VERY close to a neighboring table. It was as if we were having dinner all together. This would have been understandable if there hadn't been any other open tables, whoever, there was. Not a deal breaker, but it wasn't our favorite experience there. The food was still worth it though! LOVED the food and service! If I lived closer, I'd be dining there a few times a month. Fresh pasta with sage butter is fantastic. Yummy meatballs. EVERYTHING WAS SOOOO GOOD. Chianti too! Our "go to" place! It is comfortable with excellent food. The staff is some of the best in Eugene. They are friendly and accommodating. The gluten free pizza is outstanding!! Ciao Pizza is one of my very favorite restaurants with friendly personal service and delicious food. but they also have a full menu with regular specials, every one of which is a tasty delight. I recommend it to all of my friends. I also make certain to take visitors there for a real treat. We eat here several times a year and it is always good service and great food. I tried something different this time and was happy I had leftovers so I can enjoy it again. The lasagna is enough for 3 meals for me, especially if I have a salad and bread to start. Salad greens come from a local farm and everything is made fresh when ordered. This restaurant has many options and everything sounds delicious. We ordered pasta and we had a very enjoyable evening with great taste, flavor and freshness. Really enjoy having found Ciao after many years away from it. It’s our new favorite Italian go-to! Great variety on the menu and the food is always delicious. Great specials and every day fare. Definitely recommend! This place is quite a little gem. I never would have guessed such good food would be found in a strip mall area. Everything we had was terrific and our server was outstanding as well. This would be a regular spot for dining if we were not just passing thru town. Delicious chicken dinner with risotto and braised greens. Reasonably prices. Would have wrote a better review if this experience had been as good as some of our others. But this one did not go so well. The pizza here was excellent - love the thin crust. Surprisingly, the ciopino was also excellent! we would definitely return if we are in the area again. Don't let the location in a strip mall fool you. This is no generic pasta joint. The food is top notch! my only wish was a wider selection of quality wine by the glass. Great food and wonderful atmosphere. The Ceasar salad was excellent. All the food was fresh and really good and service was friendly and quick. Great spot for pizza, many choices plus make your own option. Sandwich and Salad options also available if pizza not your choice. Good beer and beverage options to complement your food choice. Cozy, comfortable décor and good service. Give it a try. Great food, as always! Ciao is an excellent go to restaurant in the Eugene area. Bread, salads, pizza, pasta & wine do not disappoint. We had a pleasant evening, glad to get last minute reservation. We arrived and didn't like the table so we sat at the bar. Chose an inexpensive bottle of wine which was good. Appetizer of bruschetta was a big proportion and tasty. The main courses were also ample sized. We chose dessert to go. Overall a pleasant meal though nothing amazing. We did have great service. Pizza was very good, I really liked the crust. Service was excellent, was a good value for the money. Kid friendly. The chocolate chip cookie skillet is delectable. Recommended by nearby hotel staff and it more than lived up to its billing as the Italian place to go in Springfield. I would highly recommend to anyone with a sophisticated palate. I love this place!!! Their calzone is delicious. We also had their cheese bread and that was also delicious!!! Recommended by a friend and we weren't disappointed! Very good pasta dishes, chef was willing to be creative by mixing some pasta sauces as requested. Great result. We will return. A bustling, energetic place! Loved the big brick pizza oven. Ordered the cioppino and it was DELICIOUS! Our waiter gave us such great, personal service. We will definitely go back! Food was fantastic as always. We frequently dine at Ciao for lunch and dinner. Great menu, friendly staff. Food was nice, noise level of interior is distracting as acoustics seem to be associated with hard surfaces. Like the restaurant. Wine list is good. food choices good. server was nice. enjoy the smell of Italy .